Times are rough and everyone can use a couple of extra bucks for the holidays. Fear not though, tech has come to save you (sort of, provided you don’t need any serious cash) with apps that let you earn real money from just using your smartphone. There’s certainly no shortage to choose from, but many don’t have the glowing reviews you’d want, given the investment of time required – and some seem to be an outright scam. Incredibly, there are genuine, real ways to make money online without getting scammed. All you need is a smartphone, some. Or lots of free time and a relaxed attitude to constantly being bombarded by adverts. Profitzoom is one of the apps we found and really liked, which offer a quick buck for completing simple task on your smartphone. The app give its users coins for watching advertisement videos, which can later be redeemed for real money you can add on your PayPal balance. The app is really simple to use. 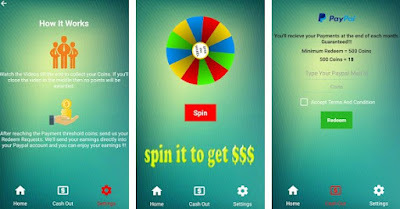 The interface is simple and straightforward, and once you create your account and log into the app, you can immediately start completing the task and collecting coins. After you collect a certain amount of coins, at the end of the month all of them will be transferred on your PayPal account. Just note that 500 coins are equal to 1 US dollar. So for example, if you want to get 100$ dollars at the end of the month you will need to collect 50 000 coins. It may seem like a big deal but in reality the coins add up quickly if you use the app regularly. So if you stay consistent and complete as many tasks possible, every day, you will get there.